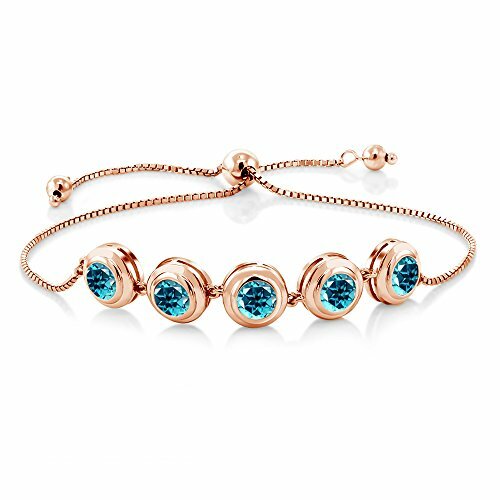 18K Rose Gold Plated Silver Tennis Bracelet Set with Paraiba Topaz from Swarovski by Gem Stone King at Lamont Design. Hurry! Limited time offer. Offer valid only while supplies last. Beautiful and brilliant pair our Swarovski Topaz bracelet with career or weekend outfits. Featuring a radiant flawless 925 Rose Gold Plated Silver . Beautiful and brilliant pair our Swarovski Topaz bracelet with career or weekend outfits. Featuring a radiant flawless 925 Rose Gold Plated Silver . This item is perfect for any event and holiday. The secure fit promises carefree wear and stability, while the appearance ensures that this bracelet will be the center of attention on any ensemble. As always with all of our products this item comes in packaging making it ready for gifting as soon as it is received.This beautiful item is brand new and comes with complimentary gift packaging appropriately selected to match the item you purchased. The packaging ranges from dainty foam insert packaging to luxurious leather insert cherry wood boxes. Every order is fully insured regardless of value. This insurance protects you against damage or the loss of your item while in transit. The Shipping and Handling fees include the insurance so there is no need to pay separately for insurance. VIBRANT- Gemstones make this Tennis Bracelet beautiful and romantic all at once! Crafted to a standard of perfection This Tennis Bracelet is a truly outstanding piece that belongs in every jewelry collection Made in the USA Gem Stone King products are always made with the highest quality elements and standards. SECURE- The clasp on this Tennis Bracelet is meant to allow comfortable and carefree wearing. You can pair it with any outfit and wear without worry. This Tennis Bracelet features a modern design that will make the perfect gift for any occasion! Fully adjustable for versatile wearing!